Today, April 1, 2019, marks the day that the 2000 visual novel Never7 -the end of infinity takes place. 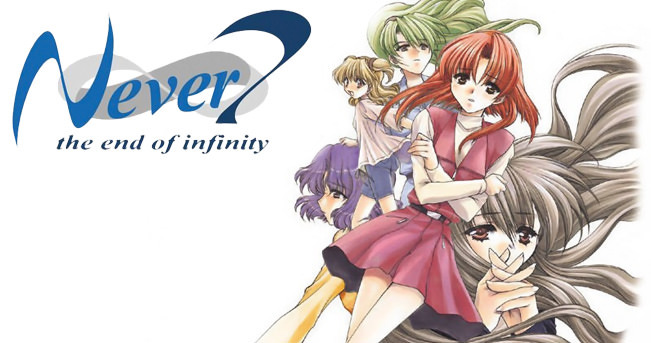 Never7 was the start of the famous Infinity series by the now-defunct company KID, followed by the more famous titles in the series, Ever17 -the out of infinity and Remember11 -the age of infinity. It was also famous for jump-starting the careers of its main creative team – scenario writer Kotaro Uchikoshi, and director/scenario writer Takumi Nakazawa. The game also has a very personal place in my own heart, being the first game I ever translated (albeit an unofficial fan-translation) that was the spark to my own career in the localization business. It taught me the ins and outs of translation, directing, and localization, led to the creation of Lemnisca, and was where I met teammates who I still consider close friends to this day. So to commemorate this game, I would like to spend the next few days covering a retrospective of the game and its production history. WARNING: This retrospective contains spoilers all the way to the end of the game. Tokyo, Japan, 1999. Fresh off the development of their soon to be surprise success first original visual novel, Memories Off, Kindle Image Develop, more commonly known by the acronym KID, who had only dealt with handling the porting of adult visual novels to consoles until that point, was eager to continue venturing into the visual novel (known in Japanese as the “ADV”) market. In response, Kotaro Uchikoshi, the lead writer of Memories Off, conceived the idea for an original PlayStation visual novel known as infinity. While Memories Off was the story of a young man who learns to open his heart to love again after the tragic loss of the love of his life, infinity could be considered to be its antithesis, built around the concept of a protagonist who would prevent the death of the protagonist’s love through premonitions of the future. Much like Memories Off, this title would be a romance VN, whose ultimate goal was for the player to develop a relationship with its each of its heroines and end up as a couple with the girl of their choice. Uchikoshi had initially wanted to use more science fiction elements in the story, but was instructed by KID’s higher ups to de-emphasize those elements and focus on the romance and the heroines as the selling points. While the staff ultimately decided not to make infinity a sequel to Memories Off, they decided to leave in a few subtle references to the game that indicated the two could take place in the same universe, such as having Izumi mention herself as a former student of Sumisora, the game’s school, and featuring the main heroine of Memories Off, Yue, as a little girl. However, when asked, the staff neither confirmed nor denied that it took place in the same universe. As the concept developed, the main idea changed from a protagonist who simply had premonitions to time travel. Instead of truly having precognition, it would turn out that the protagonist was in fact stuck in an infinite time loop where the heroine kept dying each time, leading him to go back in time to try to save her. In-game, this was represented with each character route having two parts; the first part being a four day common route followed by two days centering around the heroine. Upon her death, the protagonist would be sent back in time, and the second part would begin: a repeat of those six days with the protagonist attempting to use his knowledge to change history, save the heroine, and help her with the emotional issues surrounding her. Initially, the setting of the story was intended to be a peninsula that had been cut off by a rockslide in order to prevent the cast from fleeing, but due to staff members questioning why the characters wouldn’t just climb over the rocks to escape, this was changed to an isolated island during a week of rough sea weather. The development team’s staff was helmed by director Takumi Nakazawa, making his first original game debut as a director after having previously directed the Wonderswan port of the game Kiss yori…. The scenario draft was written by Uchikoshi, and in addition to him, the writing team was comprised of four other writers: Nakazawa (in his debut work as a scenario writer), Chabou Higurashi (also from Memories Off), Takeshi Hodoshima, and producer Kazuhiro Ichikawa. To this date, with the exception of Higurashi confirming he wrote the second loop of Haruka’s Route, the assignment of the routes to the writers remains a mystery. The character designs were handled by mangaka Yuna Kagesaki, probably most famous for her manga Karin (released in English as Chibi Vampire). The staff instructed Kagesaki to draw different face variations for the characters, but she misinterpreted these instructions and drew both face and sprite variations; an act that would go on to receive praise from players. The soundtrack was composed by KID’s resident composer, Takeshi Abo (who would go on to compose the rest of the Infinity series and would later compose for the famous Science Adventure series, containing famous titles such as Steins;Gate and Chaos Child). When composing, Abo first read the game’s story to get a grasp on its atmosphere and characters, and created music based off those, ultimately result in a lighthearted soundtrack with multiple suspenseful/tense tracks to match the game’s more surreal moments, described by Abo as “geometric.” A soundtrack CD was later released for the game which, in addition to the game’s soundtrack, contained a drama CD depicting a non-canon scenario taking place in the game’s world. 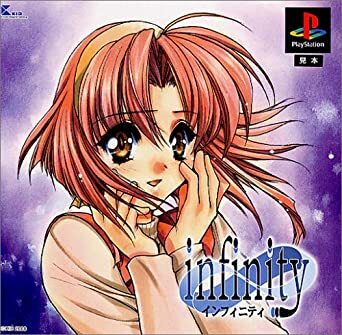 infinity featured a voice cast consisting of both popular and new voice actors of the time: the late Tomoko Kawakami for Yuka Kawashima (famous for the leading role of Revolutionary Girl Utena), Yuki Matsuoka as Kurumi Morino and Haruka Higuchi (in one of her earliest roles before she later became famous from anime such as Azumanga Daioh and Bleach), Wakana Yamazaki as Saki Asakura (famous for the role of Ran Mori in Detective Conan), Kikuko Inoue as Izumi Morino (famous for playing Kasumi Tendo in Ranma ½ and Belldandy in Ah My Goddess), and Susumu Chiba as Okuhiko Iida (relatively new before he became known for roles in anime such as Gintama). The voice acting was directed by late voice actor Ken Yamaguchi, who also played a small part of a doctor on Haruka’s Route. However, due to the amount of voice acting the game featured, the voice recordings had to be compressed to fit onto a single CD, and to this date, the uncompressed recordings have never been used in any version of the game. infinity’s development deadline was scheduled for January 2000, a decision that made a number of staff members, such as Uchikoshi, concerned that their data would be lost with the feared Y2K bug, though no such errors ultimately occurred. After the game’s writing was completed, the staff had some disagreements about the game’s route order. Nakazawa wanted there to be a free route order as was traditional of romance visual novels, while Uchikoshi wanted a stricter order. After discussing their opinions, Nakazawa ultimately compromised by leaving the routes free to player choice (with the exception of Izumi’s Route, initially locked), but compensated by gradually increasing the difficulty of reaching routes by order, and by subtly showing the recommended route order in the opening credits of the movie by displaying the heroines in recommended completion order (Yuka->Haruka->Saki->Kurumi->Izumi). infinity was finally released on March 23, 2000. Unfortunately, the game’s sales did not match up to KID’s expectations, and the PR department blamed this on the fact that the team had been instructed to hide any trace of the game’s time travel gimmick from advertising to keep the game’s main twist a surprise. Because of this, players who may have been potentially interested in such elements never picked it up. 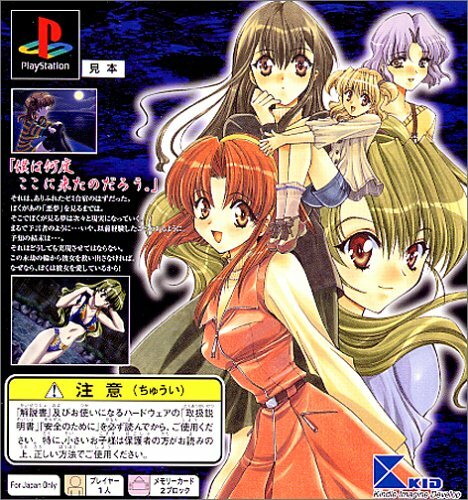 Furthermore, even the finished product was met with a mixed critical reception by players; while they praised the time travel gimmick and the overall quality of most of the routes (particularly how each route contained links to the other routes and how most characters still had parts to play even outside their own route, as it was a common complaint in visual novels that said characters usually disappeared on every route asides their own), there was a sense of disappointment over the final route seemingly writing off everything that happened in the story as merely a prank, creating a strong sense of anticlimax and ended the game on a somewhat sour note and created contradictions with the game’s explanations of the time loop phenomenon. The game was awarded a score of 26/40 in Famitsu, Japan’s largest gaming magazine. To make matters worse, the game contained a fatal bug where Izumi’s Route could not be reached, forcing KID to quickly issue a reprint of the game with a fix of the bug (the fixed versions of the game were denoted with a star next to the logo on the CD itself), and also allowed players who’d bought the first version to replace their copies for free. Overall, infinity did not meet up to either the commercial or critical success KID had been anticipating, and was largely ignored in favor of Memories Off.